Class cancellations due to weather or other unforseen circumstances will be posted online. In Oklahoma, foodservice establishments in mandated counties are required to have at least one employee who is a Certified Food Manager (CFM). Certification must be renewed before expiration in required cities and counties. If you have never had a license or your license has expired, the OH&LA can help! We know you are busy, so we designed our course to take only one day. We have packed it with important information and an exam that earns you industry-acknowledged national certification. The certification courses are held from 8:30 a.m. - 5:00 p.m., with lunch provided. Upon receipt of your completed registration form and payment, the OH&LA will send you the new ServSafe® Manager textbook. The last hour of the class is dedicated to taking the necessary exam, which includes 90 multiple-choice questions. You must make 75% or greater to pass the test. Completed exams will be sent immediately to the National Restaurant Association's Educational Foundation for grading. ServSafe certificates are no longer being mailed out. They will now be available for download 5-7 business days after testing on ServSafe.com. The first thing you'll need to do is register for a class by contacting Jill Bishop at (405) 942-6462 or (800) 375-8181. As soon as we receive your registration and payment we will send you the textbook. We strongly encourage you to read this book and complete the study questions at the end of each chapter. This is a fast paced class that will cover food safety principles in a short amount of time. An English Diagnostic Test and English Answer Key is available for download; a Spanish Diagnostic Test and Spanish Answer Key is also available. This is highly recommended because it contains information that will help you prepare for the exam. Also, space is limited in each class and courses fill quickly. We recommend that you register at least two weeks prior to attending to allow time for shipping and study. Although the class is taught in English, the textbook is available in Spanish, Chinese and Korean. The test is available in Spanish, Korean, Chinese, French Canadian, Japanese, and large print. Call us at least one month in advance to be sure we have the test in stock for the language you need. You MUST bring your textbook, a pencil, and valid photo identification (driver's license, state ID, military ID, greencard or valid passport) with you the day of your class. In the event of a business or personal emergency you may reschedule your class date twice at no extra charge. A $15 fee will be charged for each subsequent date change. As an added convenience to our OH&LA member multi-unit operators, we can provide in-house ServSafe sanitation training. These classes can be scheduled for a minimum of 20 people with the operator providing a classroom-style meeting room and any desired refreshments and lunch. The cost for the in-house class is discounted to $105 per person trained (minimum class size 20 people) plus a $500 instructor fee and mileage outside the OKC metro area. OH&LA provides the instructor, an on-site assistant, all instruction materials (books, tests, etc. ), additional proctor if more than 30 being trained, AV, coordination with National Restaurant Association on grading, processing certificates and coordinating with OKC and Tulsa City County Health Departments with affidavits, and other health department documentation. Contact Jill Bishop at (405) 942-6462, (800) 375-8181 or jill@okrestaurants.com to schedule an in-house class. **Organizations needing less than 30 people trained at a time must register and attend one of the many pre-scheduled classes identified above. 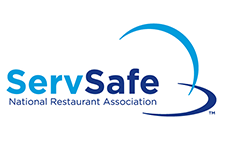 ServSafe classes typically reach max attendance at least two weeks in advance so register early to avoid splitting your group into multiple classes.